In this Customer Project article we look at a rover that can be controlled from any device with a web browser. 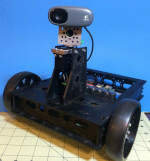 Wallace the Rover is an autonomous tracked robot built by a user on Instructables. This build is a good demonstration of the proper way to protect and use a RoboClaw motor controller. In this Customer Project article we take a look at a handy robot for those living where winter brings snow.